Create a picture-perfect photo card for any occasion using our large collection of stylish greeting card templates. You can photos, text, and even your own artwork for that personalized touch! Customize both the front and back of your photo card and place your order. Once they arrive at your door, they’re ready to send out with the included complimentary envelopes! Our card stock greetings have that classic look that are ideal for any card occasion, and graduation is no exception! Select from a multitude of photo graduation announcements and fill yours with your graduate’s best moments from high school. From senior portraits to prom, you can make the perfect invitation to queue your friends and family in on your ceremony’s time, date, and location! In addition to pictures, you can also add text or even your own artwork. 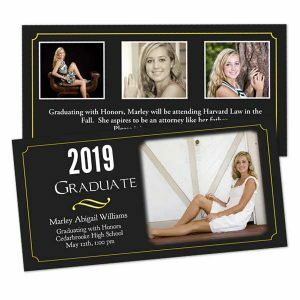 No matter your needs, Print Shop is here for you when you need graduation photo cards printed to your specifications. Design the perfect Mother’s Day photo card front and back with photos and a personal greeting. Our online card maker allows you to select from a wide array of custom options with just a few taps to your phone screen. Upload Mom’s favorite photos online and create a greeting that brings a smile to her face. Our card stock cards have a quality look and feature everyone’s favorite memories which you simply can’t get with store-bought greetings! When you can’t seem to find the perfect Father’s Day card at your local card shop, design your own using your favorite photos and our selection of card layouts. We offer multiple templates that you can fill up with photos and text. Even better, our card stock greetings can be printed front and back. Let Dad know how much you care and design a picture-perfect greeting that comes from the heart! In addition to photo cards, we also have a wide array of personalized gifts for Father’s Day. Custom print Dad’s favorite photos on coasters, mugs, neckties, and more! Make your own announcements using your favorite photos. Our double sided photo greetings cards have a wide selection of card layouts to choose from. Create a beautiful wedding photo announcement using your favorite couple’s photo. Or, design your own custom birth announcement using your little one’s first picture. Upload your photos and choose a card template that’s right for you. Life’s milestones deserve to be announced with a high quality photo card. So, let your creativity reign free and design the perfect customized announcement to send off to your friends and family, no matter the occasion. Looking for unique party invitations? You’ve come to the right place. Create the perfect invitation at Photobucket Print Shop to send out to loved ones and friends for any occasion. 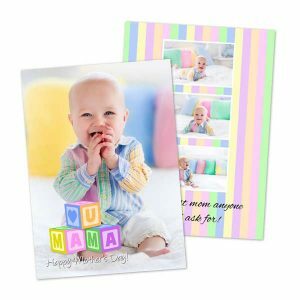 Our double sided card stock photo cards can be custom printed front and back for that personalized touch. Create photo birthday invitations, custom graduation cards, and baby shower invites using some of your favorite photos. You can also customize your card’s text to compliment your card template! No matter the occasion, you can kick it off in style by sending out stunning invitation to your prospective guests! Photobucket Print Shop uses the best paper with quality pigmented inks. As a result, your cardstock photo cards will have a professional look. From double sided Christmas cards to custom wedding invitations, you can create a greeting for any occasion that with photos showcased in bold, vivid colors. Furthermore, our online card maker is easy to use. Upload your photos and create greeting cards designed by you, today!